Explanation: One might say this was a bell weather day for the Sierra Nevada mountains. 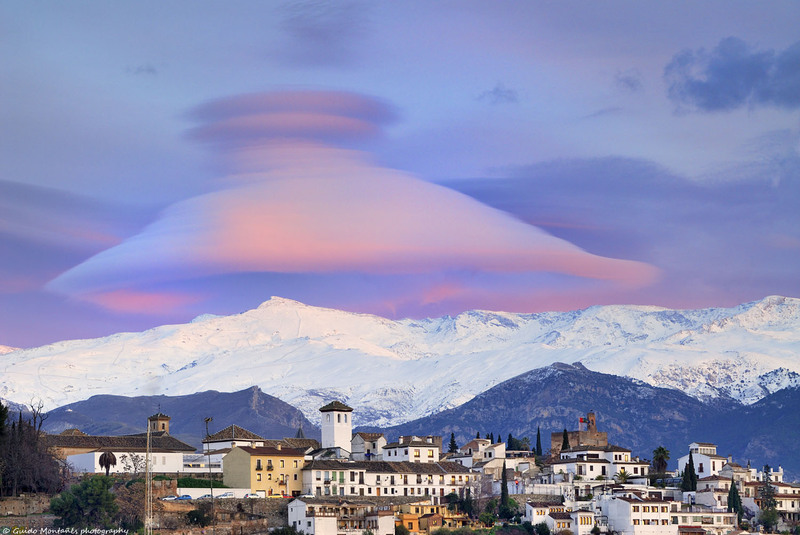 In January, just as the Sun was setting above the district of Albayzín in Grenada, Spain, a huge cloud appeared as a bell capping the Veleta peak. Such a Cap cloud is formed by air forced upwards by a mountain peak, with the air then cooling, saturating with moisture, and finally having its molecular water condense into cloud droplets. Such a bell-shaped cloud structure is unusual as air typically moves horizontally, making most clouds nearly flat across at the bottom. Vertical waves can also give additional lenticular cloud layers, as also seen above. Given the fleeting extent of the great cloud coupled with momentarily excellent sunset coloring, one might considered this also a bellwether day for an accomplished photographer.